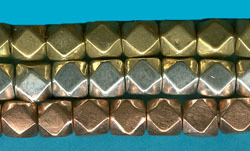 Cornerless cube bead approx. 9 x 9-9.5mm, 2mm hole. Sold in 24″ strands, approx. 66 pieces. Made in India. Due to the handmade nature of these items color, size, and strand length may vary. Click here for larger image. Available in Brass, Silver Plated, Copper Plated and Gold Color.